Followit Sweden AB has been chosen as the sole supplier to a 3 year project, LEMED-IBEX, in the French and Italian Alps for the tracking ibex. The order amounts to at least 150.000 EUR in 2018 and may be expanded during the project until 2020. Deliveries will be progressively in the first half of 2018 and the order is our largest so far. Followit Sweden AB has received a big order on Tellus collars for tracking elephants. The customer is a state-owned wildlife conservation authority in a Southeast Asian country. The order is one of Followit's largest and is a breakthrough for Followit's growth effort on wildlife tracking systems. The order value amounts to 195.000 USD with delivery during the first quarter of 2018. The new model Contact GPS 3 is designed to be a multi-purpose tracker - useful the year around. Use it as for personal security while hiking in the mountains, secure your ATV against theft or track your dog while hunting. The new app helps you organize your hunting team, invite team members and keep track of all your trackers. Choose which map provider you want to use and only pay for the features you are using. The release is scheduled for October 2017. Follow the link to read more ». Together with the release of Tellus Micro we are also launching our new web platform Wildlife GEO. This platform has a number of new features compared to the earlier version of GEO. First and foremost the user interface is remodeled from the bottom up and is now 100% responsive, meaning that it will adapt depending on if you use it from your desktop computer or your tablet or smartphone. So now you can seamlessly continue your work, no matter where you are. The new platform also reflects all the configuration options available with the new generation of Tellus collars such as Tellus Micro. 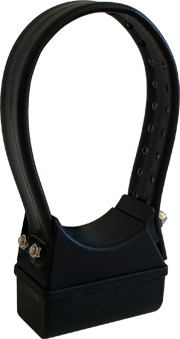 The new Tellus collar is the latest result from more than 20 years of experience in GPS aided wildlife tracking. The weight of the collar is from only 70 g which opens up a wide range of new research possibilities. Despite its small size it still has features such as remotely controlled drop-off and GSM/GPRS options.